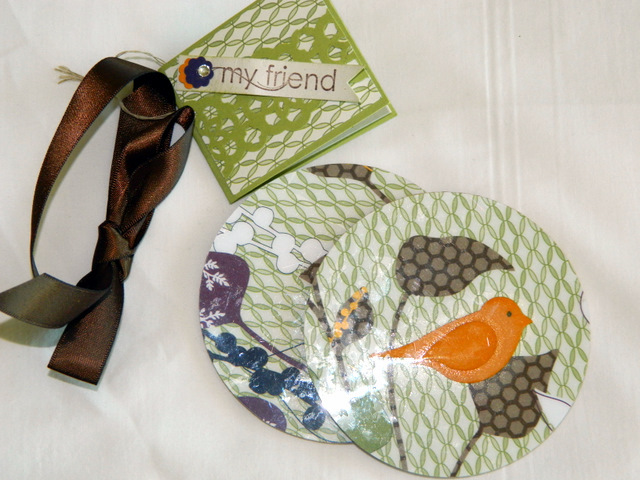 These are coasters given to me by my friend, Sandy Grimes – aren’t they pretty? Today is our check in day, buses are running tours to the Stampin Up campus and demonstrators are picking up their bags and awards. Tonight is our Kick Off Party! There will be amazing displays, demonstration booths and a big party to get us going into convention mode! I’m excited to be doing a demo tonight at one of the booths so won’t be posting much tonight since I’ll be miked up and busy sharing by presentation. Wish me luck! I get nervous in front of crowds but at least all stampers are easy going and friendly. Here are a few swaps by 2 of my downline team members here, Susan Scarpelli and Debbie Hileman. They did some great cards here! This entry was posted in SU events and tagged memento mall, stampin up convention, stamping ideas, swaps, tutorials. Bookmark the permalink. You will do great tonight. Have fun and will wait for the pictures.